Rule was born on March 28, 1931, in Plainfield, New Jersey, and raised in the Midwest and California. She earned a bachelors degree in English from Mills College in 1952. In 1954 she joined the faculty of the Concord Academy, a private school in Massachusetts. There Rule met Helen Sonthoff, a fellow faculty member who became her life partner. They settled in Vancouver in 1956. Eventually they both held positions at the University of British Columbia until 1976 when they moved to Galiano Island. Sonthoff died in 2000, at 83. Rule died at the age of 76 on November 28, 2007 at her home on Galiano Island due to complications from liver cancer, refusing any treatment that would take her from the island. Rule, who became a Canadian citizen in the 1960s, was awarded the Order of British Columbia in 1998 and the Order of Canada in 2007. 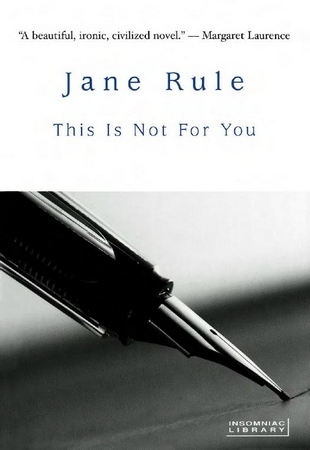 In 1994, Rule was the subject of a Genie-awarding winning documentary, Fiction and Other Truths; a film about Jane Rule, directed by Lynne Fernie and Aerlyn Weissman, produced by Rina Fraticelli. She received the Canadian Authors Association best novel and best short story awards, the American Gay Academic Literature Award, the U.S. Fund for Human Dignity Award of Merit, the CNIB's Talking Book of the Year Award and an honorary doctorate of letters from the University of British Columbia. In January of 2007, Rule was awarded the Alice B. Toklas Medal for her long and storied career as a lesbian novelist.